As told by Dan Schaefer…. 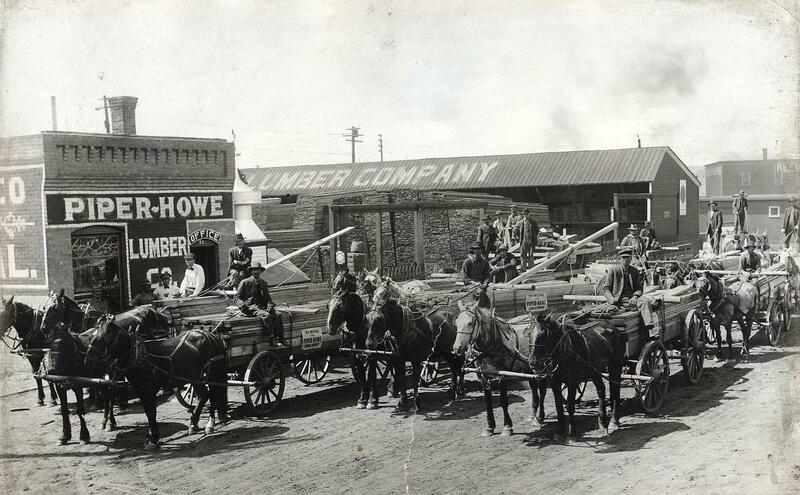 Lumber loaded in Minot for barn built on W A Schaefer farm, Sitting on the wagon far right front is my grandfather. The farm is 7 miles southwest of Minot. My grandfather, farmed my dad, W J Schaefer farmed and I farmed. My Dad and I grew up on this farmstead and I still live there.W A Schaefer moved from Iowa in 1908 and bought the farmstead from a homesteader named Babst. When I would talk to people from my father’s generation and tell them where I live and farm, I would often hear the stories about the many barn dances they had attended in that barn. It is a very large barn, with a big hay mow. 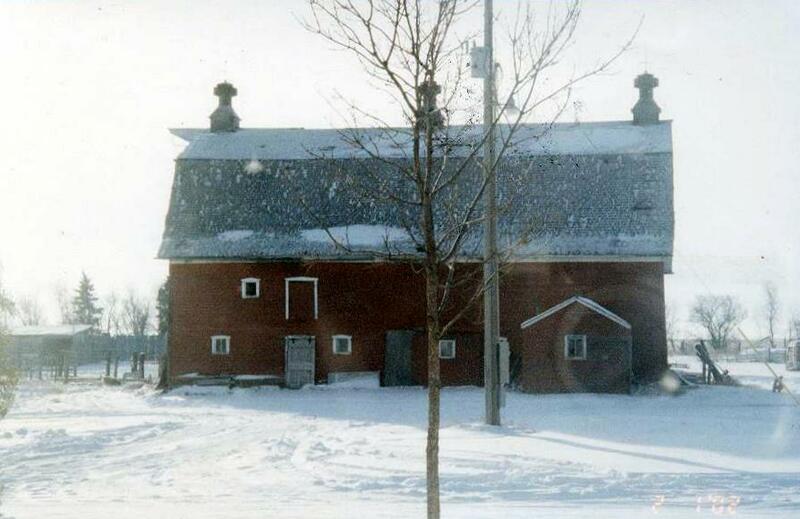 The 3 cupolas on the roof were attached to wooden vertical air shafts for ventilation to the main floor of barn. The barn was used for housing horses and cows in the horse drawn farming days. Loose hay was pulled up into the hay mow from wagons on the ground via a pulley and brought into the hay mow on a rail running at the top just under the roof. Hay was pulled in and moved into the hay mow and then dropped inside. The hay mow would be filled with loose hay, then pitch forked to main floor via holes in hay mow floor. 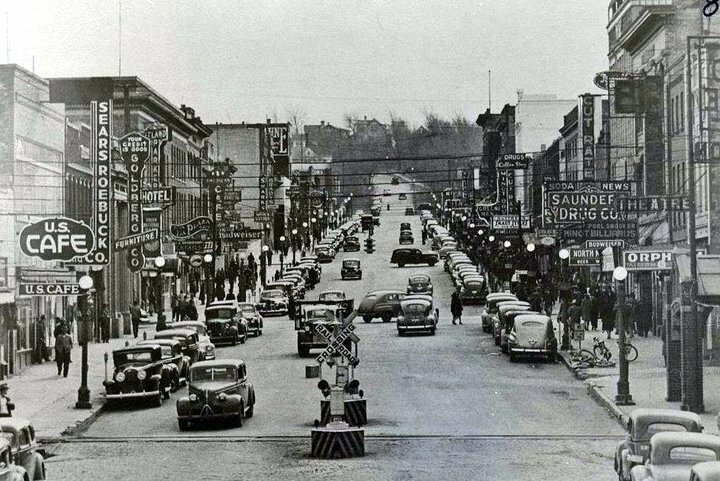 Later in mechanized farming times small square bales were moved into the hay mow via electric chain bale elevators. The bales were stacked high inside by another electric elevator. Half of the main floor of the barn was converted for milking cows in early 1960's. Myself and 4 brothers, would shoot baskets in the hay mow. We still have a hoop and backboard in the hay mow. Pictured below are the wagons of lumber for the barn loaded at the Piper - Hove Lumber Company in Minot.